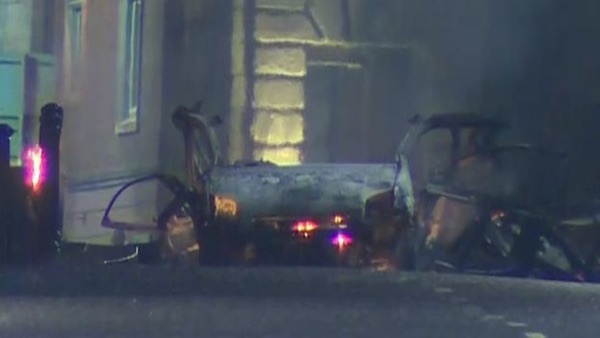 There were no injuries and no damage was reported following the bombing, which took place after the area around the vehicle was cleared following a coded bomb warning. In their statement, the new IRA also warned those providing support to the British that “they are to desist immediately as no more warnings will be given”. It reads, in full: “The IRA claim responsibility for the bomb attack on the Courthouse in Derry last week. Despite a heavy presence by the Crown Forces, our Volunteers returned safely to base. “We will continue to strike at Crown Forces personnel and their imperial establishment. “We also caution those who collaborate with the British that they are to desist immediately as no more warnings will be given. Although it has repeatedly said it has no links to the new IRA, seven members of Saoradh were arrested in the days after the explosion. Brian Kenna of Saoradh said the arrests were part of an attempt to demonise the group, underlined by the fact that those arrested were all released without charge. There have been claims by some politicians linking the bomb to developments in regard to Brexit, while others have denied that any such link exists. Asked about the comments, Mr Kenna said Brexit had brought the Border into “sharp focus”. He said he understands why people would be willing to resist British occupation of this country. “In every generation, the last 800 or more years, has resulted in people taking up arms against British occupation. I understand that and that continues,” he said. The former chief of the PSNI police Hugh Orde has become the latest British ‘security’ figure to warn that the return of a hard border in the North risks the resumption of serious conflict. Speaking on RTE’s This Week programme this week, Orde said recreating a hard border through Ireland would have “huge consequences in terms of security” and police and customs officers “would become a target”. Orde’s comments follow similar remarks by the current PSNI chief George Hamilton, who has accused the British government of failing to understand the impact of Brexit. This week he announced that he is to retire from his post at the end of June, just as a hard border is set to be put in place. He did not connect the two events.